Forget the cellar; everyday wines are meant to be poured, not stored. 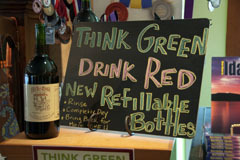 Which has led a handful of wineries to turn to the refillable approach in hopes of putting a cork in their bottles’ environmental impact. Meyer is president and winemaker at Pend D’Oreille Winery in Sandpoint, Idaho, where a red blend called Bistro Rouge is sold in 1.5-liter glass bottles that customers can bring back, well washed, and get a refill at a discount from the regular price.